If you are using browsers as Firefox, Opera, Microsoft Explorer, Microsoft Edge you may experience some graphic differences or problems with the website. We recommend using Chrome to navigate more efficiently. Website: go to our home page and press the button "login" up on the right (1) or the button “Get Started Now”. Website on mobile: go to our home page and scroll to view the email field and the green button “register". iOS App: go to our "home" and scroll to view the green button "Get started”. 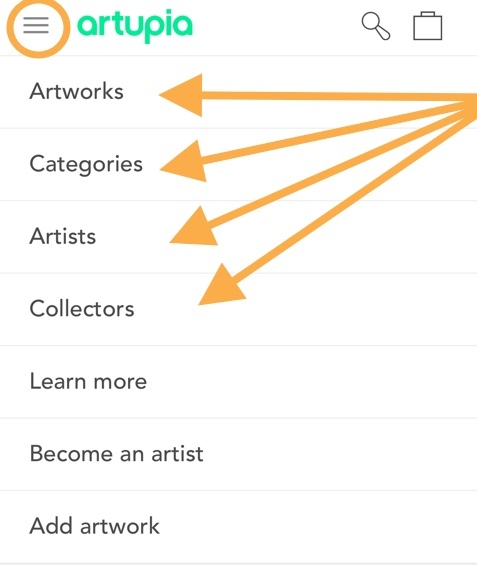 Then you can discover our artworks through the navigation bar in the upper part of the platform. Artworks: explore the latest artworks uploaded by our artists from 28 nations. Categories: find the best artwork through categories based on passions, emotions, subjects, colors, rooms and many more. Artists: compare different styles from artists with different ages, cultures, and visions. Collectors: have a look on the collections of your friends and other art lovers. Search bar: write the subject that you are looking for and discover our artworks related.